It seems that releases from iOS developers Tapbots are like London buses in the sense that you hear nothing for quite some time, then all of a sudden three come along at once. Well, in this instance it is only two but I’m sure you get the picture. 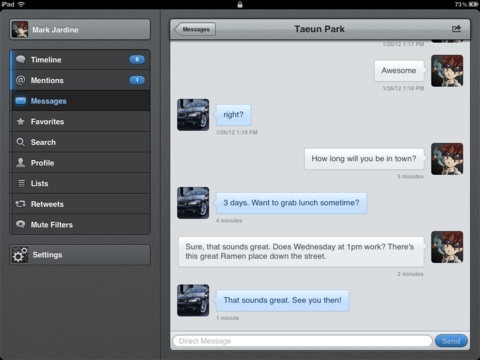 Tapbots’ popular Twitter application, Tweetbot for iPhone and iPod touch has been given the version 2.0 makeover with the latest version hitting the App Store today featuring a number of upgrades and enhancements. After announcing the release of the 2.0 version of Tweetbot, the developers at Tapbots decided to post out a little teaser on Twitter, choosing to use the ‘One more thing’ tagline made famous by legendary former Apple CEO Steve Jobs during his keynote speeches. Tapbots announced that if the one more thing tweet received at least 1000 retweets, then they would announce and release something else. So, what were they referring to? It seems that the 1000 retweets were reached quite quickly, with the company introducing the world to Tweetbot for iPhone’s bigger brother – Tweetbot for iPad. 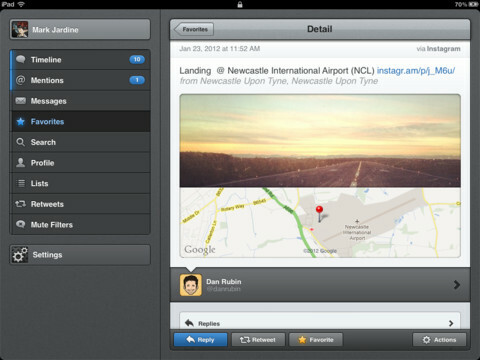 It has been ten months since the original launch of the Tweetbot Twitter client, and in that time, it has risen to be one of the most profitable and critically acclaimed Twitter applications thanks to its customized and polished user interface, and the unique user gestures it offers to invoke certain actions such as reply and viewing conversation history. But one thing has been missing, the one thing that users have been screaming for consistently and the one thing that I don’t think anyone saw coming which is the iPad version of Tweetbot. Multiple user timelines. Quickly switch between your lists as your main timeline. Smart gestures. Use Twitter more efficiently with time-saving and configurable gestures. Customizable navigation. Hide the navigation tabs that you never use. Support for multiple services like read It later, Instapaper and Cloud App URL shortening. Save drafts, add locations and points of interest, attach photos and videos and much more. Tweetbot for iPad obviously builds upon the success of its older iPhone brother by bringing the same beautiful Twitter experience to the iPad. 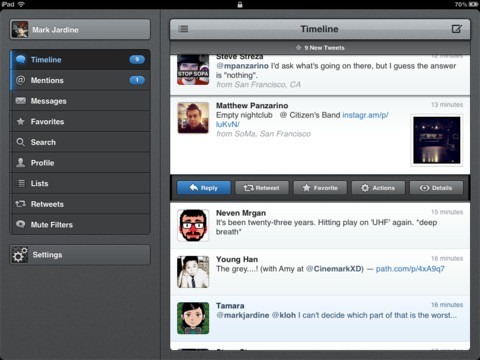 The iPad version of Tweetbot is available to download now in the App Store at a cost of $2.99 and requires iOS 5.0 or above.